"No one runs a navy ship out of anywhere," a senior defense official told the Washington Free Beacon. "This whole notion that we got run off is not true." The official was responding to a statement issued by Chinese Defense Ministry spokesman Wu Qian who said the USS Hopper was confronted during the passage near Scarborough Shoal, in the Spratly Islands, by the PLA navy missile destroyer Huangshan that took action to "drive it away." The senior official said the Chinese hailed the Hopper by radio but there was never any instance when the Hopper changed course. The guided missile destroyer was conducting what Navy officials call an "innocent passage" operation designed to ensure that international waters such as the South China Sea remain open. The operation was the 13th Navy warship operation in the South China Sea since 2015. China has built up some 3,200 acres of new islands in the sea and has begun building military installations, including missile batteries, on some of the islands. Last October, the same Chinese destroyer, the Huangshan, confronted the destroyer USS Chafee near the Paracel Islands in the northern part of the sea. Two JB-11 aircraft and one helicopter also were used to warn the Chafee. Military experts say the U.S. policy of asserting freedom of navigation operations in the sea but failing to direct the operations against Chinese military expansionism is sending mixed messages to Beijing. Retired Navy Capt. Jim Fanell said the Pentagon response to the Chinese in the sea has not matched Defense Secretary Jim Mattis' new policy of strategic predictability and operational unpredictability. Mattis announced last week that the United States regards countering threats posed by China and Russia as the main military missions and that operations against Islamic terrorism will no longer be the military's main priority. "It seems to me that being ‘strategically predictable' must include speaking clearly and unambiguously about areas where we have strategic interests," Fanell said. "To date, it seems we have been strategically ambiguous about our view of the PRC's claims in the South China Sea," he said, using the acronym for People's Republic of China. "We seem to be more concerned about not provoking the PRC, than we are about clearly stating our position and backing it up by our actions." Mattis is expected to visit China in the next several months, Japan's Kyodo news agency reported Jan. 16. Asserting that the United States will fly or sail wherever international law permits also is not strategically predictable. "It is ambiguous and we followed up that statement with confusing and ambiguous actions in all these FONOPS or innocent passage transits over the past three years," Fanell said. "It is time to stop the ambiguity at all levels and speak clearly—the PRC does not have a legal claim of sovereignty over these artificial islands and other features in the South China Sea. As such the U.S. Navy should be steaming inside 12 nautical miles of every feature in the sea." 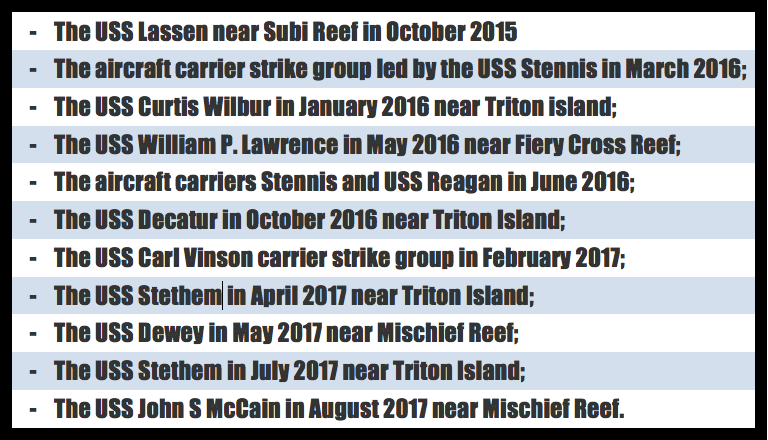 The Trump administration's first freedom of navigation operation in May involved the missile destroyer USS Dewey. After the operation, the Foreign Ministry said the Chinese navy sent two frigates, the Liuzhou and Luzhou, to "expel" the destroyer. For three other operations since then, the Chinese have asserted that military ships merely warned U.S. ships to leave the area. Pentagon spokesman Army Lt. Col. Jamie Davis declined to address Wu's assertion. He said in response to inquiries about the Hopper passage near Scarborough that such operations are "not about any one country, nor are they about making political statements." "U.S. forces operate in the Asia-Pacific region on a daily basis, including in the South China Sea," Davis said. "All operations are conducted in accordance with international law and demonstrate that the United States will fly, sail, and operate wherever international law allows," he added. During fiscal year 2017, which ended Sept. 31, the Navy conducted freedom of navigation operations, known as FONOPS in Pentagon jargon that challenged excessive maritime claims near 22 coastal states, including both allies and partners. "FONOPs are designed to comply with international law and do not threaten the lawful security interests of coastal states," Davis said. "FONOPs do not challenge which claimant has sovereignty over any naturally formed land features; rather, FONOPs challenge what maritime rights are claimed around such features." Since the operations always are conducted under international law "they never pose a threat to the lawful security interests of coastal states," he added. Both the Chinese Defense and Foreign Ministries, however, denounced the Jan. 17 passage by the Hopper as a violation of China's sovereignty. Wu, the defense spokesman, used harsher language than his Foreign Ministry counterpart, accusing the United States of causing trouble. The spokesman said the United States sent vessels "illegally" around China's islands and reefs on multiple occasions. The operations endangered the safety of both vessels and personnel, he added. The Hopper's passage also threatened China's sovereignty and security, harmed regional peace and stability, and acted against the development of stable relations between the United States and China and their two militaries. "We hope that the United States will respect China's sovereignty, respect the efforts made by the countries within the region, and not cause trouble out of nothing or make waves," Wu told the state-run Xinhua news agency. Wu said the Chinese military would continue to defend the islands and intensify patrols by ships and aircraft. At the Foreign Ministry, spokesman Lu Kang said in a statement that the Hopper sailed within 12 miles of Scarborough Shoal, that China calls the Huangyan Dao, "without gaining permission from the Chinese government." Lu said the Chinese navy, after identifying the warship, "warned the U.S. vessel to leave." "What the U.S. vessel did violated China's sovereignty and security interests, put the safety of Chinese vessels and personnel who were in the relevant waters for official duties under grave threat, and contravened the basic norms for international relations," Lu said. "China is strongly dissatisfied with that and will take necessary measures to firmly safeguard its sovereignty." Lu said China respects freedom of navigation and overflight in the South China Sea but opposes "any country using navigation and overflight freedom as an excuse to hurt China's sovereignty and security interests." "We strongly urge the U.S. side to immediately correct its mistake and stop making such provocative moves so as to avoid undermining China-U.S. relations and regional peace and stability," he added. Defense officials said the "innocent passage" operation is similar to a freedom of navigation operation." Legal analysts say "innocent passage" concedes that a coastal country owns the target of the naval passage while freedom of navigation challenges that claim. In July 2016, the international legal organization Permanent Court of Arbitration unanimously ruled against China's claim to have sovereignty over some 90 percent of the South China Sea. China has rejected the court's ruling, asserting it has a historical claim to the strategic waters that see up to $5 trillion in global trade pass through them annually. The USS Hopper carried out an "innocent passage" not a freedom of navigation operation (FONOP) within 12 miles of Scarborough Shoal on Wednesday evening, said a U.S. official who also said the "message" is the same as with a FONOP. 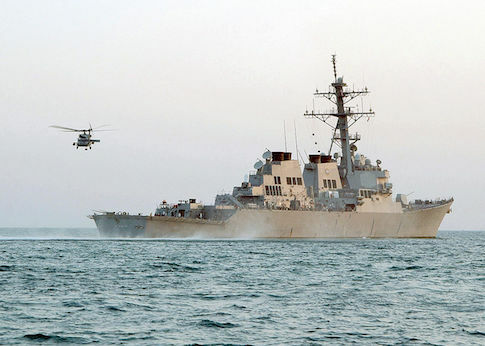 The guided missile destroyer was shadowed by a Chinese Navy ship, and the Chinese missile destroyer Huangshan immediately conducted an identification and warning process to drive the U.S. ship away. Scarborough Shoal is among the more strategic locations in the sea. China is planning a major buildup of forces on the island that is located about 150 miles from the Philippines coast. The shoal is claimed by both China and Philippines but beginning in 2012, China began turning away Philippines fishing vessels. During all freedom of navigation operation since October 2015, Chinese naval vessels have confronted U.S. warships with little or no response from the United States. This entry was posted in National Security and tagged China, Military, Pentagon. Bookmark the permalink.